What am I missing here. There seems to be all sorts of modifications addressing frustration with drill press depth stops. Why not a simple spring clamp? That’s just fine and dandy as long as the clamp doesn’t slide. I can’t imagine using enough force to move the clamp but I’ll try it and see if there is ever a application that would require/make it move. I thought maybe I was missing something regarding the set up. What’s wrong with the stop nuts? Really nothing wrong with the stop nuts. I have seen quite a few videos and posts about the inconvenience of fiddling with the darn things just to set the depth stop. I know on my previous drill press it was very fast and convenient but not so much with this new one. I played with trying to make this move and you would purposely have to be putting a lot of pressure to make it move. Something that you probably wouldn’t be doing at the end of your drilling. I played with trying to make this move and you would purposely have to be putting a lot of pressure to make it move. Something that you probably wouldn t be doing at the end of your drilling. I disagree…I owned the Delta 16” years ago with the “dial” stop and loved it (touch the bit to the piece, dial in the desired depth on the easy to read scale and then lock it in) I left that behind on a move and later bought the Delta 17” with the rod that I hated from day one. 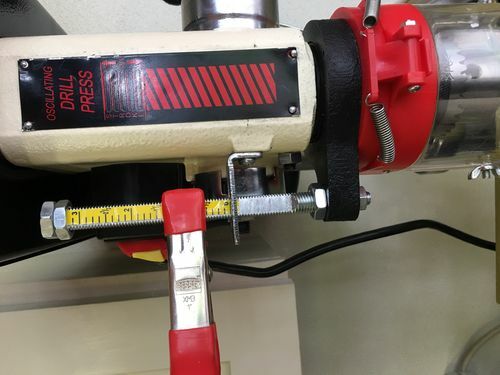 It would slip the threads on the stop nut with little pressure…and calculating depth requires a calculator. I can see how one would rather us an alternative to the new “design” (not really designed and it shows) depth stop and nuts on newer presses. I was fortunate to find an old press in super shape. I can spin the nuts and they’ll ride the threads for some distance. They’re conical with coined edges, which makes so much more sense. They work perfectly. No issues setting them quickly and reliably. We may have had similar machines. Mine was a Shopsmith and very easy to set the depth stop. I’m struggling with moving these nuts and haven’t had enough time on this machine to dislike it as much as I think I will.